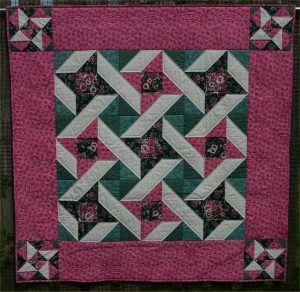 The interweaving ribbon effect of the Friendship Star blocks makes this an attractive wallhanging or lap quilt in its own right, particularly with the pieced “Star of Beauty” cornerstone blocks. With the addition of a 16″ square pocket on the back, the 52″ square quilt can be folded up into what the British would call a cushion, but which the Americans refer to as a “pillow” – which gives rise to the combination name given to this type of project – a “quillow”. It is available to buy as a download pattern for £8. I designed it as a “next step” project for those who had made a few simple items, and now want to try something more interesting – with enough support and guidance to establish good technique, build your skills and obtain a great result, even if you are making this by yourself without the help of a teacher. Firstly, all the pressing directions of the seams has been carefully pre-planned so that not only all the horizontal & vertical seams, but also all the diagonal seams will meet in opposing directions, giving a beautifully flat line-up at the seams, and perfect points. 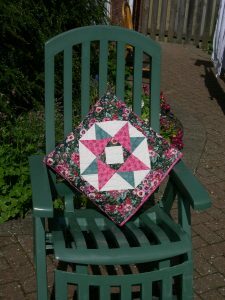 Although the blocks could have all been made in the same colours, there is a reason that I did the nine Friendship Star blocks with four of one colourway (I used pink), and five of another (I used green). It’s to help you understand (if you want to know), how this pre-planning works. 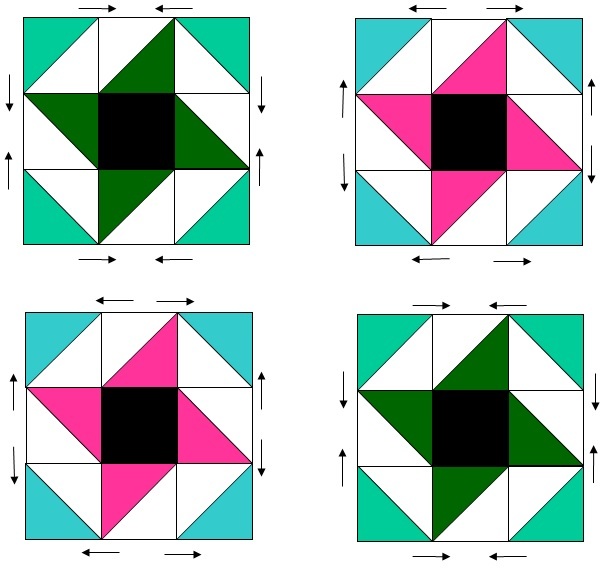 For example, the diagram shows how the row seams that are pressed out on the Pink blocks meet those pressed in on the Green blocks. Look at the vertical seams – can you see how these are also pressed differently to make them line up beautifully? The diagonal seams are pressed differently too – but you don’t need to worry why – just follow the instructions carefully, and it will all happen automatically. There is an option to complete it using plain borders, but using a small patchwork design as a cornerstone is an effective tactic. 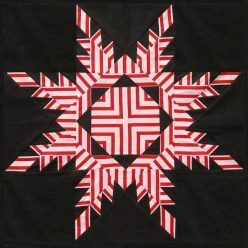 This “Star of Beauty” design, unlike the Friendship Star, cannot be quick-pieced, so new techniques are introduced. These are all included in the 12 page pattern available for £8 from my online Shop. 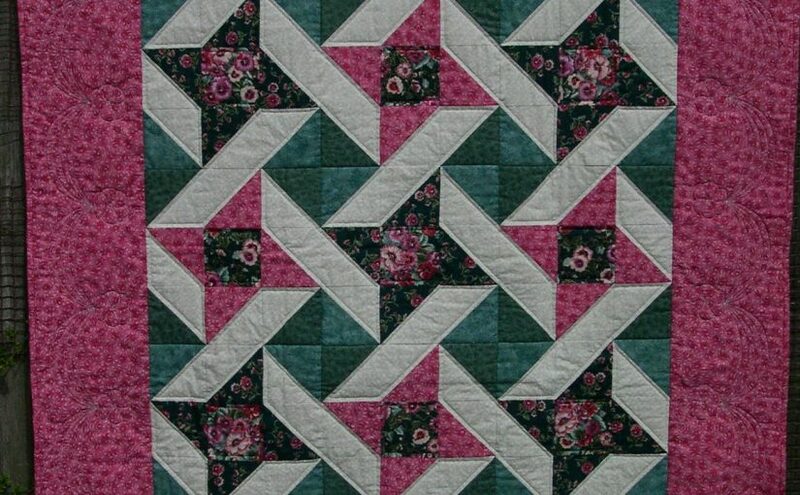 I also wanted to use this pattern as a graded introduction to the different types of machine quilting. 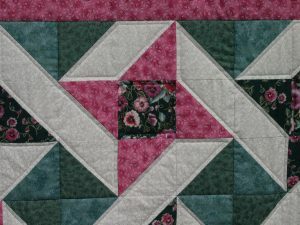 The easiest is to outline quilt 1/4″ away from the main design lines using a walking foot – this technique is used on the main Friendship Star panel. 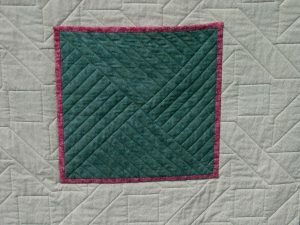 Many people try quilting “in the ditch” as their first attempt, but this is actually much more difficult to get right, and I don’t recommend it until you are more experienced. The next step up is to continue with the walking foot, but to stitch gentle curves rather than straight lines. Swags are a good design to try this, after being marked using a template. 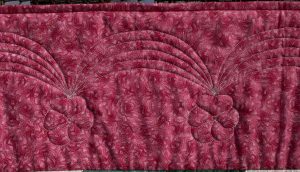 The final style is to have a little try at free machine quilting, stitching small pansies at the tip of each swag. 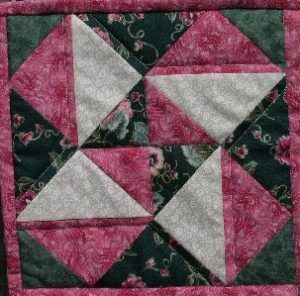 After completing the quilting, and binding the quilt, it can be made into a quillow by stitching down three sides of a separate panel at the centre of the back. I chose another block for this called Air Castle. 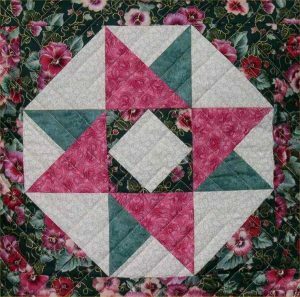 This requires quarter square triangle units, so is a chance to try out yet another technique. This quilt has a special resonance for me, as it was completed shortly before we received the news that my youngest sister had inoperable stomach cancer. In a situation where there is nothing that you can do except show your love, a quilt named Friendship Star seemed appropriate – and so it was given to Rosalie as she spent the last few weeks of her life in a hospice. Do you have a special friend who would appreciate a token of your love at a difficult time?